Y'all, this is a riveting post. For sure, one of my most fascinating ev-er. But seriously, I hope it's one of the most helpful. It's spring time, which means time to break out the patio furniture from its winter hibernation and put in some elbow grease to get the furniture in tip top shape. Sometimes we do a great job at storing our nice weather gear all winter, but a lot of the times, David and I are guilty for leaving cushions out too long. AKA we've got ourselves some diiiirty cushions. Every year, I have a hard time figuring out how to clean those diiiirty cushions. What cleaner should I use? Will it actually work? Is it safe for my cushions? Safe for those of us using the cushions? This year, I went to Pinterest and got some answers. 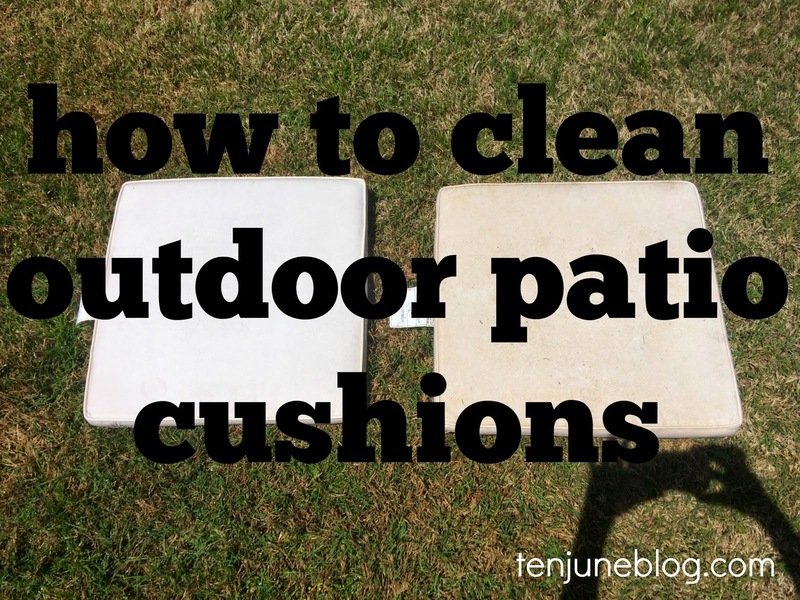 I tested out a couple of things and finally found a system for cleaning outdoor patio cushions that works for me. Wanna hear? Step one. Mix warm water with about 2 tablespoons of dishwasher detergent. We use the Seventh Generation liquid detergent and it just so happened I was at the bottom of the bottle. I simply added warm water to the detergent bottle and shook it well. Step two. I laid out my cushions on the driveway and hosed them down with the detergent + water mixture. I let them sit for about thirty minutes. Step three. Rinse the cushions down with water from a high-powered spray nozzle. The high-powered pressure is key. Gotta work hard to get that grime out. Step four. 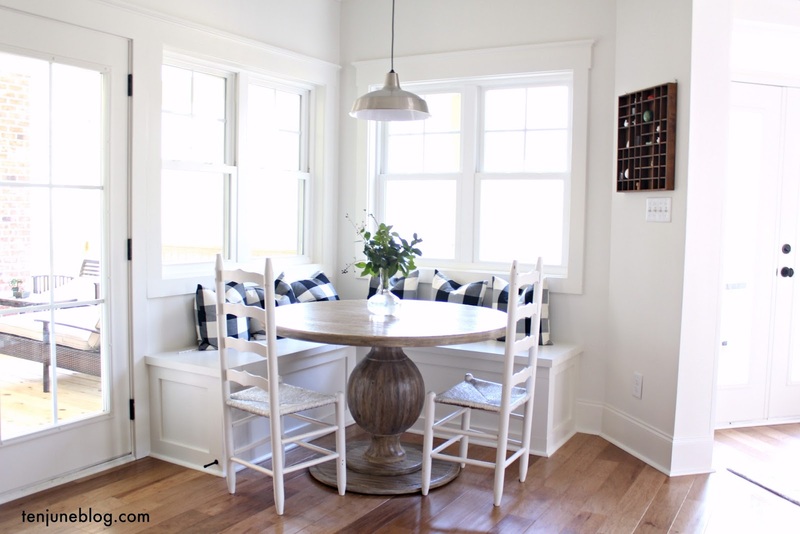 Spot treat the bad stains by sprinkling baking soda and scrubbing. I actually just sprinkled baking soda over the entire top of each cushion and scrubbed them down, just for good measure. A brush would work best, but I for the life of me couldn't find one around my house, so a rag worked fine, as well. Put some a$$ into it, though, and scrub that cushion well! Step five. Rinse down the entire cushion with the high-powered water again. Let dry in the sun! Just in case you were wondering, you get extra cool points if you're cleaning in Crocs. Just sayin'. This is perfect timing--just last night I was talking to the hubs about figuring out how to clean our porch cushions! Thanks for sharing! haha love the crocs! Great tips. We just hosted family for Easter, and it was the first time we had dined outside in a while. I had not realized how bad our cushions had gotten! I'm going to try this! I know that this one has helped many people to be very successful at affiliate marketing. Excellent blog you've got here.. It's difficult to find high quality writing like yours nowadays. Wow, is such effect even possible! I'll definitely try it! Thanks for sharing. Hello guys, My advice is to use vinegar instead of dishwasher detergent. It is natural and healthy. I love your article. My cushions need cleaning , too. Your article inspired me. Best regards! Have you tried to clean it with power wash? I usually use power wash for deck but I can be useful for a lot more.